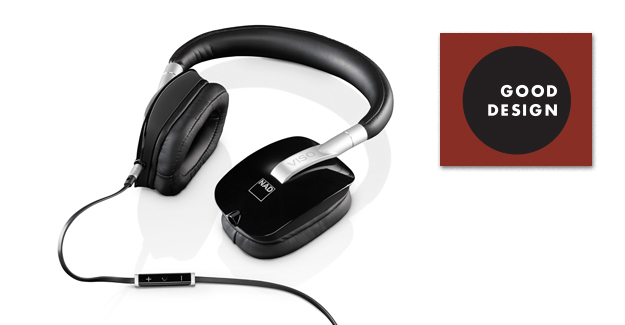 NAD Electronics is proud to announce that NAD VISO HP50 Over-Ear Headphone has won a 2014 GOOD DESIGN™ Award from the jury of design experts at The Chicago Athenaeum Museum of Architecture and Design. Designed in collaboration with David Farrage of New York’s award-winning design company,DF-ID, the NAD VISO HP50 perfectly fuses elegance, comfort, and style with the most advanced acoustic headphone design. Combining durable materials with tactile textures and a choice of colourways, the NAD VISO HP50 headphone makes a strong design statement – on the street and in the studio. It also features NAD’s proprietary RoomFeel technology to make music sound more natural by taking into account the effects a room has on music playback, resulting in a much richer listening experience. Every minute detail of the HP50 has been thought of, from the flexibility of a detachable cable with inline Apple volume & playback controls, to its multi-axis ear pad mounts that automatically adjust to the contours of the listener’s head for unsurpassed comfort. It’s all been designed with the music lover in mind. “Industrial Design is an iterative process; winning a Good Design Award from the Chicago Athenaeum for the NAD VISO HP50 is a true testament for all involved in its development.” said David Farrage, Industrial Designer of the NAD VISO series. “Working with NAD is an intimate and creative journey and so bringing an elegant and functional headphone to market is a real privilege”. Founded in Chicago in 1950 by architects Eero Saarinen, Charles and Ray Eames, and Edgar Kaufmann, Jr., GOOD DESIGN™ bestows international recognition upon the world’s most prominent designers and manufacturers for advancing new, visionary, and innovative product concepts, invention and originality, and for stretching the envelope beyond what is considered ordinary product and consumer design. Read more here from the Chicago Athenaeum.